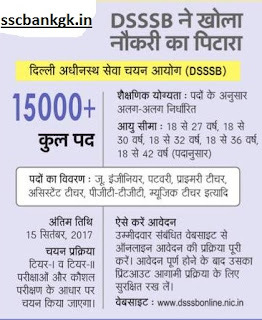 DSSSB Recruitment 2017 Delhi Subordinate 15000 Engineer, Teacher, Patwari & 1074 Grade IV Vacancy to apply DSSSB Latest Recruitment 2017. ISI Kolkata Recruitment 2017 Latest Jobs in Indian Statistical Institute Faculty, Clerk ISI Kolkata Latest Recruitment 2017. CFSL Recruitment 2017 Apply For Laboratory Attendant Jobs in Central Forensic Science Laboratory CFSL Delhi Recruitment 2017. DIAT Pune Recruitment 2017 Walkin Interview Defence Institute of Advanced Technology Jobs DIAT Recruitment 2017. 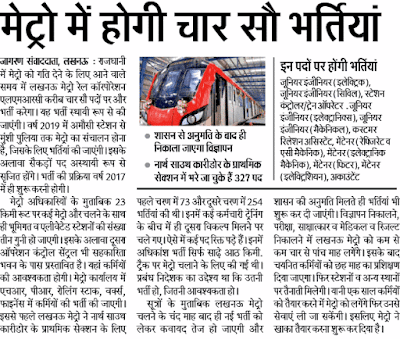 LMRCL Recruitment 2018 Jobs in Lucknow Metro Rail for 400 Junior Engineer Maintainer & Train Operator LMRCL Junior Engineer Recruitment 2018 News. Paradip Port Trust Recruitment 2017 Current jobs For Medical officer in Paradip Port Trust Odisha Recruitment 2017.